This field-proven Series of Tactical Inverter® is supplied as a System incorporating numerous safety and operational advantages over other Inverter products sold into this market. 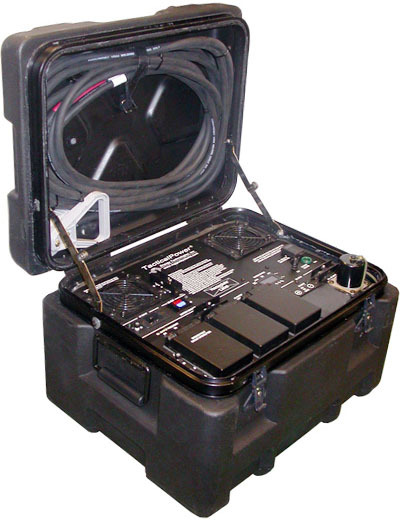 The Inverter and associated connectors, circuit breakers and cables are housed in a rugged, water-resistant, tactical case. When the case is closed, all of the equipment is protected from the elements. Heavy-duty handles on the sides serve as both lifting points for deployment and as tie-down points to secure in a vehicle or aircraft. Optional permanent mounting bracket are available for fixed installations. In addition to producing AC power, this series of Tactical Inverters also is available with a built-in 3-Stage Battery Charger that can operate simultaneously with Inverter operation. 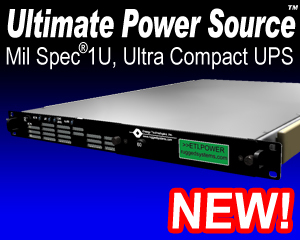 This Battery Charger can operate from 100/110/115/120 or 200/220/230/240 VAC source (depending on Tactical Inverter model - see Technical Specifications section) and charges 12, 24, or 48 VDC batteries (depending on Tactical Inverter model - see Technical Specifications section) per battery manufacture recommended charge levels and rates.